Who Can We Trust With the Environment? Today on my New England street, I watched the snow float down from the sky and collect five inches or so. School was delayed for two hours while the salt trucks were sent out to make the streets safe for children. Yet, just six hours later, they were coming home from school with short sleeves, carrying their jackets all without a single snow pile in sight. This is our new reality: extreme weather from day to day, and now even hour to hour. If looking out the window and watching the thermometer don’t say enough, the fact that 2015 was the hottest year on record – in 136 years of reporting – should hit it home. With the ice from Greenland and Antarctica melting faster and faster, that will mean displacement for millions of Americans within the next few decades due to rising sea levels and intense climate changes. Now, finally, climate change is being discussed – and not just by environmental activists, but by the future potential rulers of the “free-world,” the presidential candidates. Of course, this doesn’t include the Republicans, who are still denying reality. Hillary Clinton speaks like any good Wall Street candidate would, with vague and substance-less rhetoric – like the Paris climate talks – and an intense focus on legalities and what the government has the “ability” to do. Bernie Sanders, on the other hand, says that, if elected, he would cut emissions by 80% by taxing polluters and investing in green energy, all the while creating ten million jobs. Clinton, as with all her positions, never takes a stand when it matters. We saw this with how long it took her to say the phrase “Black Lives Matter.” We saw this with her recent change to support gay marriage. And we see it on the environment. Hillary was in favor of Keystone XL until she couldn’t be. Her big business ties make it impossible for her to implement policies that could potentially save the planet. While we need to build an alternative to corporate politicians and their inaction on climate change, this must be linked to building grassroots movements because it ultimately takes serious struggle to win change – like the one that just defeated the Keystone XL pipeline, for instance. There is clearly a real difference between the policies of the Republicans and Democrats on the environment. But this can be exaggerated. Obama opened large amounts of federal land to oil drilling, while Bush exempted fracking from the Clean Water Act. And who’s surprised? At the end of the day, Big Oil funds both parties. 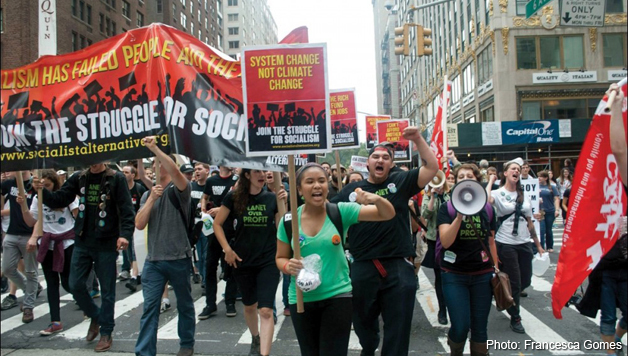 “Planet before profit” is a common slogan in the environmental movement. Many activists fight for corporations to be regulated to use environmentally sustainable business practices. But, the example of TransCanada – which, at this very moment, is suing the government for $15 billion for their “unrealized profits” they “lost” due to the stopping of the Keystone XL pipeline – shows that, not only will fossil fuel corporations fight tooth and nail against any regulation, they will also use their massive resources to attack even when they are seemingly defeated. But there is a better solution. If we took over big energy companies and put them under democratic worker control instead of private ownership, we, the working class, could run the companies in a way that actually puts “people over profit.” We could use the capital of these companies to begin to build and install solar panels and wind turbines on a massive scale to power society. We could create a jobs program to build green infrastructure that would employ millions of young people at union wages and train workers transitioning out of “dirty energy” industries without cutting their standard of living. We could democratically decide which technologies we would research and invest in and set our own regulations that could not be undermined by private interests. Capitalism, though, is incapable of this, for it is the drive to exploit and make as much profit as possible that defines this system and forces it to poison the earth. And so we must fight to build a movement that will change the way we run our economy and power our planet toward socialism. Only socialism, a democratically run, planned economy, focused on meeting human and environmental need, can stop global destruction. Workers do not want to destroy the planet. If we had the power to decide our fate, we could pass on a sustainable world for our children’s grandchildren to enjoy.